Today's project is the PERFECT first time crocheted amigurumi (stuffed doll/object) for new or even seasoned crocheters. It only requires you to know three stitches.. single crochet, single crochet increase and single crochet decrease. Doesn't get much easier than that! I had a lot of fun making these, especially since the pattern is so simple that you can do it anywhere. I was dragging my pills from the coffee shop to the side of my kids’ soccer games. Anywhere I went I was crocheting away..
Love Crochet? Don't miss these other projects! These are very much your standard Amigurumi supplies. I love just using what I have on hand, and you don't need much yarn, so it is great for leftovers from larger projects. My white yarn was from a half used skein, so I made my own cake to keep it neat. If you don't have a yarn winder but use a lot of yarn you HAVE to get one. This is the one I have and it is big enough to do an entire 1 pound skein. I couldn't live without it! There are smaller, cheaper versions on the market, but if you read the reviews you will see how this one is worth a little more money! R1: SC 6 into MagicCircle/MagicRing (6) in your first color. R1 (Alternative): CH2 and work 6 SC stitches in second chain from hook. SlSt to close loop. To get a perfect line between the red and the white, I used this technique from Planet June.. although if you don’t mine a color jog you can just do a simple color change. Stuff relatively firmly. (You can also add the eyes and embroider the words onto the pill at this time, or leave them eyeless and wordless). You will need to add additional stuffing as you close the other end of the pill. Finish off. You can either InvDec across the gap, weave ends through the front loops, or just stitch the opening closed with the end of the yarn. Alternatively PlanetJune also has a great technique for finishing off 6 stitch circles. 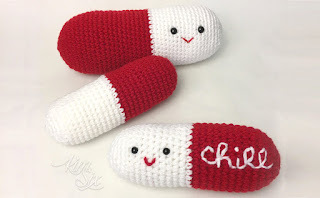 I embroidered the word "chill" on one side of the pill, but you could put anything you wanted. I considered phrases like "fuckitol" or "tylenol." They can be uniquely yours. To change the sizes (either smaller or larger) you just remove or add increases and decreases and to adjust for the change in size, you also add THREE ROWS for every increase and remove THREE ROWS for every decrease. The printable pattern has more details about the pattern change as well as example instructions for the larger and smaller pill. If you liked that, you may enjoy these other projects!